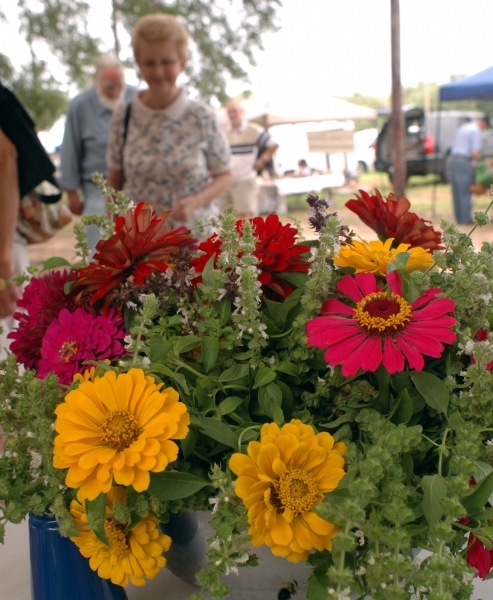 Several years ago Bob and Cindi Bjork gave up the city life in Tucson, Arizona where they had well-paying corporate jobs and took on the challenges of organic gardening in East Texas. That’s quite a life style change. It meant walking away from the glitz and glamour, and the short trips to the grocery store, to literally becoming the grocer for the neighborhood. And the neighborhood, well that changed too, from having neighbors next to neighbors… to having neighbors down the road. There are the obvious drawbacks to swapping the life in an air conditioned office building to dwelling among the birds and the bees in 90-plus degrees of Texas humidity but listening to Cindi, you get the impression she embraces the move. 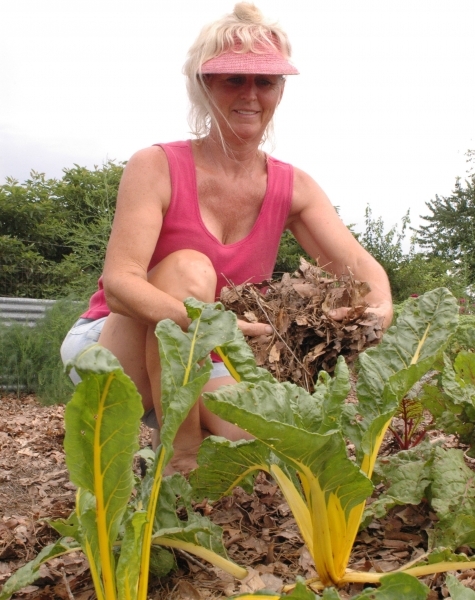 She’s a self-taught gardener, having made more than one mistake along the way and together the Bjorks jumped through all the hoops to become “organic” … substituting the chemicals most of us have grown up with, to using natural means of controlling bugs and blight. During the growing season, and that is much of the year for one crop or another, she gets her hands dirty daily… it’s not a once in a while or a when-they-want-to, life style. She mulches and mulches again and when she watches her crops begin to grow, it’s pleasing to note the absence of weeds. How deep is that mulch? “Four to six inches,” she replies. It didn’t get their without work but it is a necessary part and “a key” to gardening when it’s done correctly, she says. On any given day she’ll be knee deep in melon vines one moment and among waist high asparagus waving in the breeze the next. There’s the odd snake to contend with and it’s part of gardening. 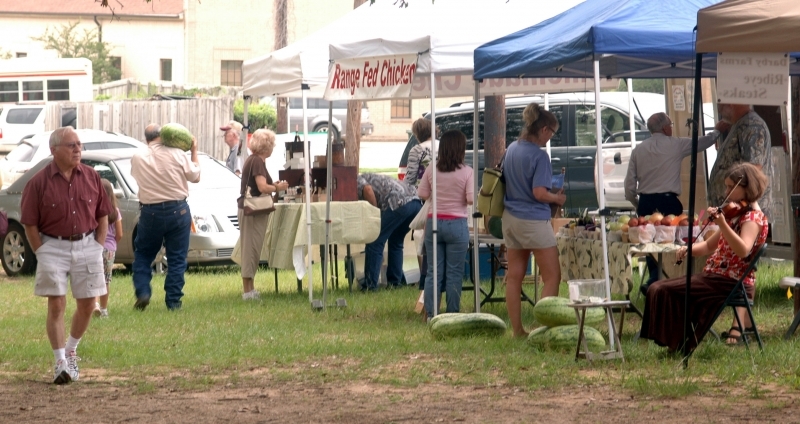 She sells her produce from a small building a 10 second walk from their home, through nearby grocery stores and on Saturday’s at a farmers market in Tyler where she joins other like-minded “farmers” in providing wholesome, home grown vegetables for city dwellers just like she and Bob used to be. 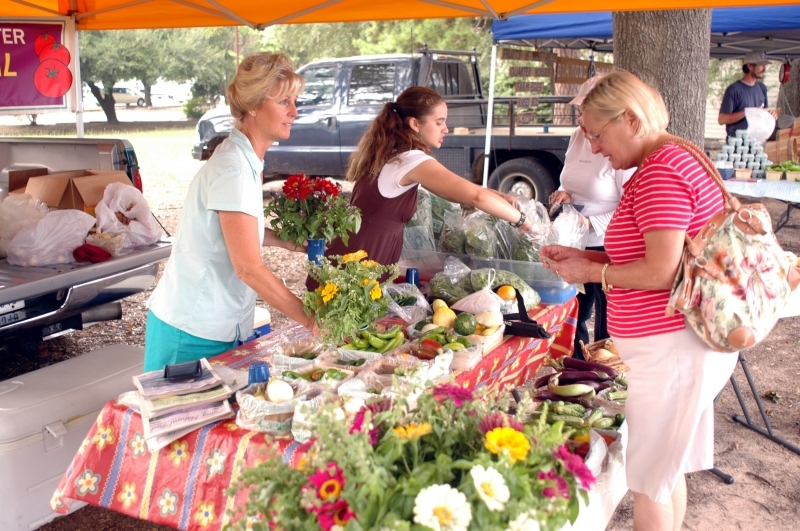 At the market, shaded by a tent and giant oak trees, Cindi and a family friend, Jessica Pinckard, busy themselves waiting on the many nearby residents that come in search of fresh produce. If Cindi doesn’t have what they want, the next vendor or even the one beyond that, can fill the bill. The life style change from city to country is a passion. You only have to have one conversation with Cindi to understand that. And those who come in contact with her and others like her are the beneficiaries. At this writing Bob is involved in a monitored project that pits organic and “conventional” hay growers against each other to see which method will produce the top quality hay. The project is completing the first of a three year study and is affiliated with Texas A&M University and the extension service. The preliminary results of the first year will be released in late Aug. 09'. Stay tuned because we will bring you the results as they are presented. In the meantime "Aunt Cindi" as she's known to neighbors and friends says fall gardening is more enjoyable than summer gardening because the weather is "not so hot." 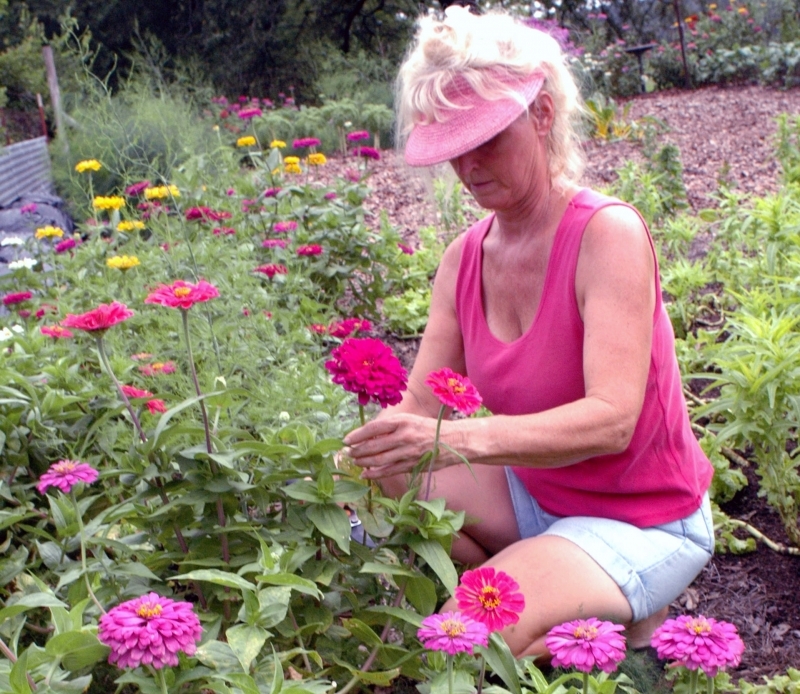 "The garden insect pests have just about disappeared with the hot summer heat," she said, and "there are a lot of fall crops to look forward to." They include broccoli, brussel sprouts, cauliflower, cabbage, carrots, beets, turnips, lettuce, snap and snow peas, collards, kale, spinach, cucumbers, dill, fennel, cilantro, winter onions, parsley and more. "Don't forget," she says, "to check your soil with a soil test kit before you start planting... you may need to add some organic soil amendments" like calcium carbonate lime, soft rock phosphate or potassium. Where can the locals get their supplies of each? Well, she just happens to keep some of each on hand for those that need them.